February is here, and that means hearts, flowers, cards, and lots of tasty sweets. And while boxes full of chocolates and candy make great Valentine’s Day gifts, they aren’t so great for the health of your mouth. Why? Oral bacteria feed on all that sugar, and overtime, it can eat away at protective tooth enamel causing cavities and tooth decay. Sugar also encourages acid production in the mouth, another trigger for painful cavities. Does that mean you have to steer clear of all those chocolates and conversation hearts? Not entirely, but you may need to switch it up. Opting for these teeth-friendly treats instead will ensure that you and your Valentine have a sweet holiday – without causing too much damage to your mouth. Sugar-free lollipops, gum, and hard candy. These can help encourage saliva production in the mouth, dislodge food particles in the teeth, and neutralize acid. Word of warning though, some types of hard candy stick to teeth, so remember to brush and floss after eating. Dark chocolate. Even though it still contains sugar, dark chocolate is also full of antioxidants that help to fight tooth decay, bacterial build-up, and plaque. Fruit. Instead of going the traditional flowers and candy route, consider a bouquet of fruit. Fruit is loaded with vitamins and minerals that protect against a slew of oral health problems, and they’re better for your waistline, too! 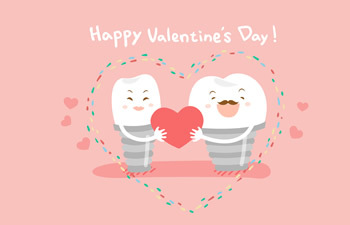 Show your teeth some love this Valentine’s Day by visiting Mansouri Family Dental & Associates. We’re here to take care of all your dental needs, and look forward to helping you put your best smile forward.